In a desperate attempt to prevent the disclosure of their corrupt engagements, Mahinda Rajapaksa has formulated a plan to get Leader of the House, Nimal Siripala de Silva appointed as the Prime Minister. It has been revealed that defeated Mahinda has been making plans since his departure from Temple Trees on Friday, to get the assistance of the UPFA MPs to oust Ranil Wickremesinghe from the position of Prime Ministership on grounds that he lacks the majority in parliament. The Constitution states the PM should receive the majority support of the parliamentarians in the house and therefore, Wickremesinghe has to get the support of at least 30 more MPs. He has instructed the UPFA MPs to gather signatures of all UPFA parliamentarians and to submit the document to the Speaker when the parliament convenes this week in order to appoint Silva in Wickremesinghe’s place. Mahinda Rajapaksa had come up with this plan in order to evade the exposure of his corrupt acts as well as the rampant corruption and plundering carried out by the Ministers of his regime, as per one of the pledges that has been made in the 100-day program that was promised by the new President. However, during a press breifing held by the UPFA this afternoon Nimal Siripala de Silva said that they accept the new Prime Minister and assured they would not raise any technical issues on the matter. He also ensured that the UPFA would not hinder the 100-day programme of the common Opposition. Meanwhile, reports also indicate that an alternative plan is being hatched to bring in Mahinda Rajapaksa as the ‘alternate’ Prime Minister. All these various schemes that have been laid out to sabotage the common Opposition plan forward and bring Mahinda back to parliament, corroborate with the fight he put up to remain in power even while the election results clearly indicated that the majority of the people had decided otherwise. 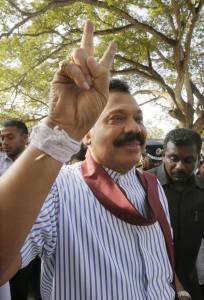 As Colombo Telegraph reported on election night, as the poll results started indicating his defeat, Mahinda had laid out plans to dissolve the parliament in the next few hours. He summoned an emergency cabinet meeting to discuss this possibility. As hours passed by and his defeat became more obvious, he had made plans along with his brother Gotabaya to declare emergency and annul the poll results. It was only when the Attorney General refused to prepare papers to declare emergency that he had called for Ranil Wickremesinghe and informed of his willingness to leave peacefully and requested for safe passage. Opposition movement Rajitha Senaratne during a press breifing today, who said that the military had refused to follow orders to deploy troops in Colombo.